For the last 10 years the biggest debate over a federal transportation bill is not how to spend the money, but where that funding comes from. Federal funding for roads, bridges and transit mostly comes from the federal gas tax. The gas tax has not been increased since 1993, and that tax revenue is not keeping pace with needs because of increasing cost of labor and materials to build and maintain transportation infrastructure. The idea of raising the gas tax has been a non-starter on Capitol Hill for a number of years because conventional wisdom is that raising the gas tax is so unpopular it would be political suicide. New polling data refutes that fact. A 2018 study done by the Mineta Transportation Institute (MTI) at San Jose State University showed that while only 34 percent of respondents supported a 10-cent increase for general transportation improvements, that number increases to 54 percent if the tax increase is done in 2 cents a year increment for five years. However, when funds are directed to specific uses- such as maintaining highways and roads, or improving air pollution- the majority of Americans support it. In fact, those surveyed showed a 72 percent of respondents supported a 10-cent tax increase if the funding went to maintenance and repair of the roads, 66 percent would support it if the funding went to improving roadway safety and 58 and 59 percent would support it if the funding went to improving local air quality or addressing global warming, respectively. The MTI report also breaks down the support based on demographics, political party affiliation and driving habits. Those results should indicate that support for increasing the gas tax will continue to grow. Race. 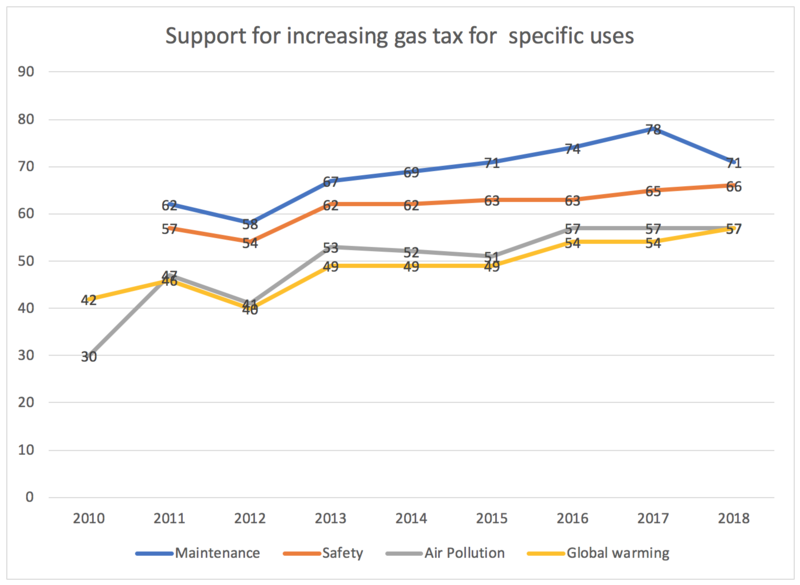 Non-whites are more supportive of increasing the gas tax than whites, across all reasons. Asian Americans and African Americans were 17% and 12% more likely to support an increase of the gas tax. Those who answered “other” were also 12% more likely to support increase taxes than whites. Age. The youngest group (18–24 years) showed the highest level of support for taxes across uses. 84% supported the tax if it went to air pollution, 77% for global warming, 87% for maintenance, and 81% for safety. All of these showed statistically significant differences versus other age groups. 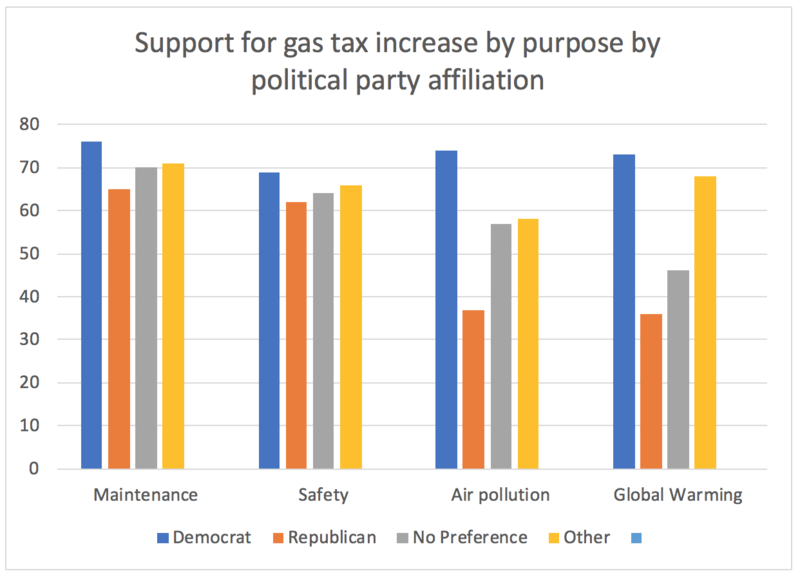 Democrats are significantly more supportive of raising the gas tax, Republicans were less supportive and those who answered other or no preference were in between Republicans and Democrats. The differences were statistically significant across all the specific uses except for safety. For safety 69% of Democrats were supportive, 62% of Republicans and of those who answered “other” or “no preference” were 66 and 64 respectively. The majority of republicans were also supportive of maintenance or roads and highway ( 65%). Republicans were less supportive of air pollution (37%) or global warming (36%). Those who drive the most (over 12,000 miles/year) are the least supportive of raising the tax for air pollution and global warming. Those who don’t drive or don’t know how much they drive are the most supportive of increasing the tax for maintenance and safety reasons. 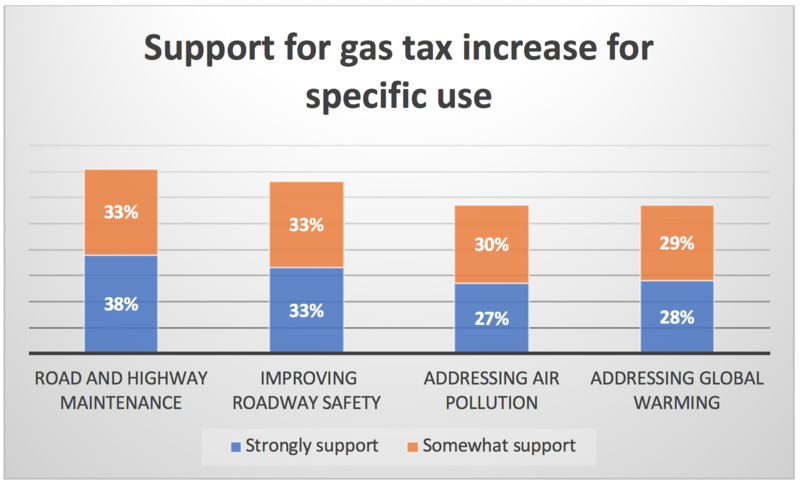 Is the support for a gas tax soft? Will this data change the debate in Congress? For the League and others who support an increase in revenue for transportation investment, these increases should mean good news. But we also need to realize that back in 2011, a majority of responses already supported an increase in the gas tax if that funding went to road maintenance or safety, and that number has been over 50% for using funding for air pollution and global warming since 2013 — before the FAST Act was passed in 2015. 2. Given the higher level of support among younger voters and people of color, that willingness to pay is likely to continue to increase. We will be watching Congress for changes in support and for opportunities to push them towards an increase in funding for a multi-modal transportation system. This study has also been asking about support for a vehicle miles travelled tax or a federal sales tax to pay for transportation improvements. Watch for a blog next week discussing those findings.